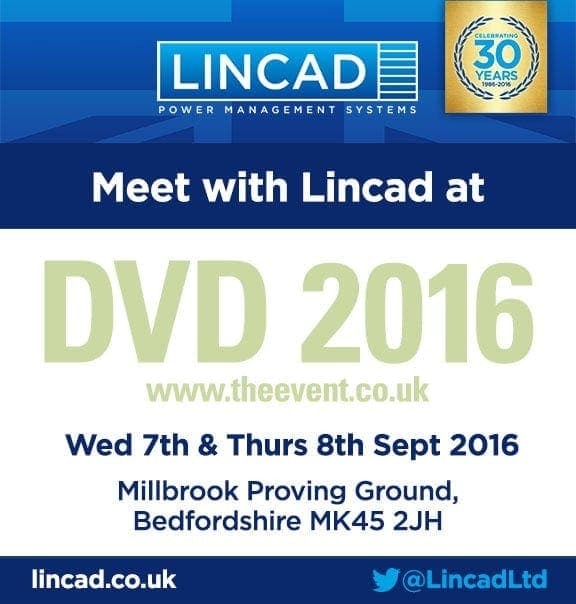 British designer and manufacturer of batteries, chargers and power management systems, Lincad, will be exhibiting at DVD2016 on 7th– 8th September at Millbrook. DVD2016 provides an effective and efficient forum for Army HQ staff, Defence Equipment and Support (DE&S) personnel and industry representatives involved in the Land Equipment sector to develop ideas and generate a greater understanding of technologies, capabilities and requirements. It remains an important event enabling this coordinated engagement through informal discussion, briefings, demonstrations and displays. Lincad will be showcasing its multi-purpose batteries, multi-chemistry chargers, and other equipment and accessories that can be used for a wide range of military applications and equipment. DVD2016 is an exhibition aimed at anyone involved in UK Land Forces and supporting services. The two-day event is sponsored by Army Headquarters and the MOD’s DE&S (Land Equipment) organisation. DVD2016 offers army staff a valuable chance to meet with multiple industry representatives in one place to be updated on developments within the equipment, support and security military sectors.